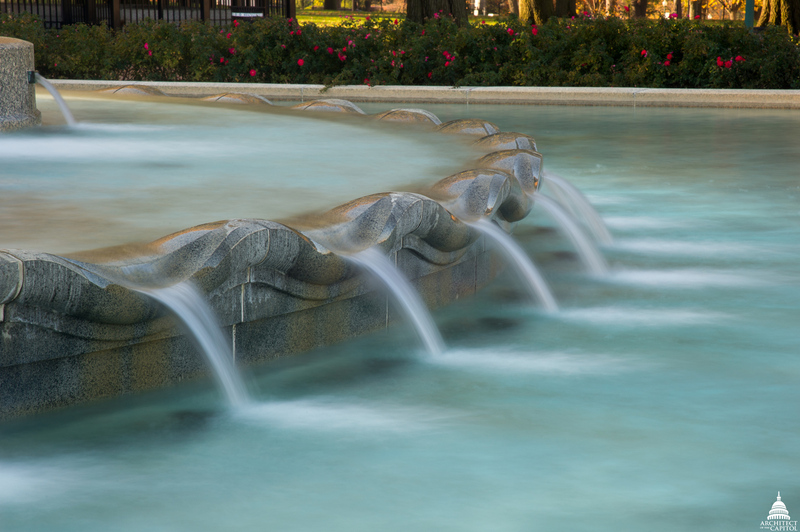 One of the overlooked gems on Capitol Hill, the Senate fountain, is nestled between Union Station and the U.S. Capitol, atop the Senate upper park. 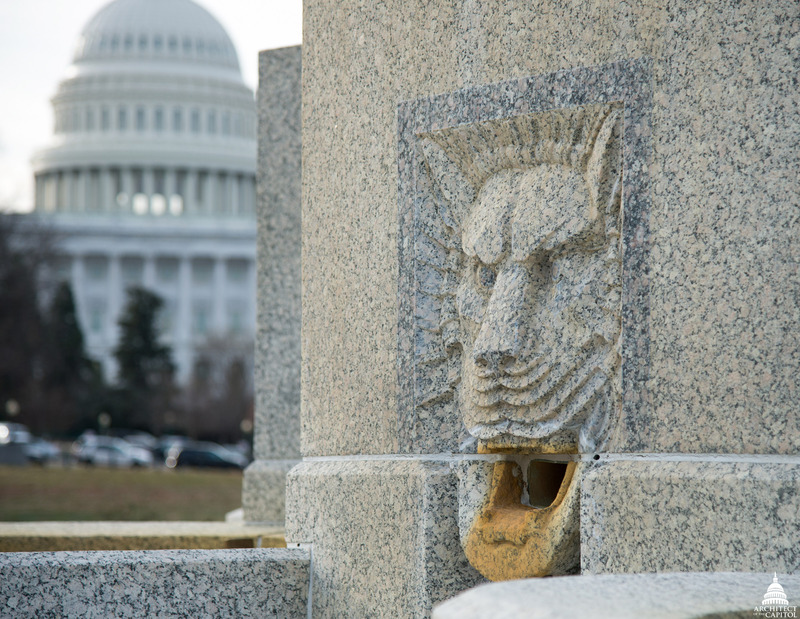 A hexagonal granite monolith with high jets of water spouting from its center, the Architect of the Capitol received authorization for its construction on March 4, 1929. 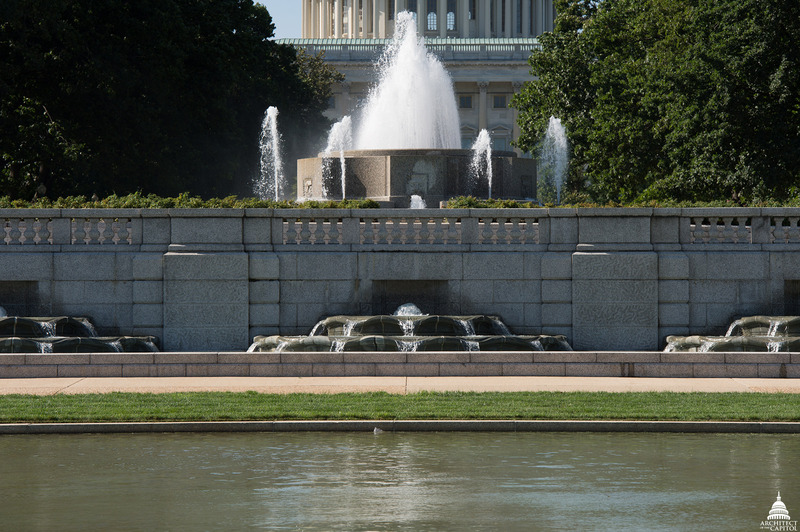 The fountain was built under the direction of Architect of the Capitol David Lynn. It operated for the first time on July 16, 1932. Designed with many unique features, the main fountain is fabricated of Minnesota Pink granite, with a basin of Minnesota Green granite. 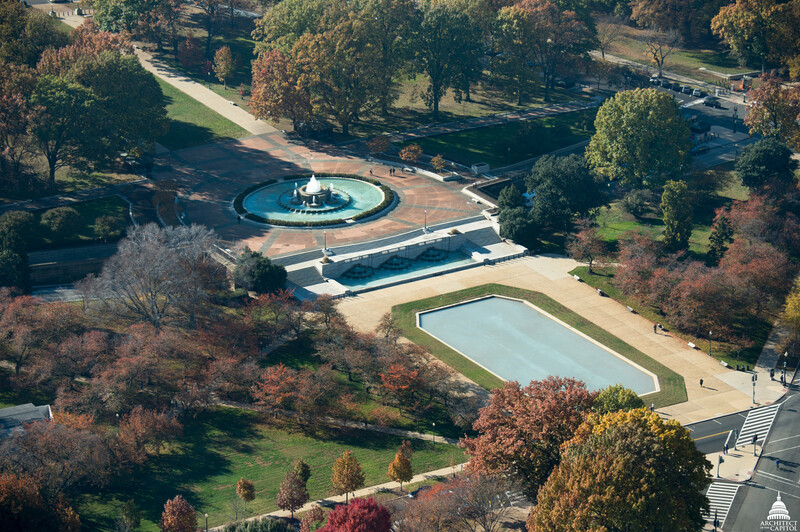 The fountain consists of three separate components: the main basin, lower level basins and the reflecting pool. From the basin, the water is piped underground to three sculpted stone bubbler fountains in the north wall of the terrace. From there the water is again piped underground to the lower level of the reflecting pool. Number of lion-head spouts on the faces of the hexagon main basin. Water streams into a large circular basin with a scalloped stone rim, over which water spill into a larger oval basin. Number of underwater light fixtures controlled by a computer program that repeats every 20 minutes. Safety features include an automatic shutoff activated by the water level dropping below the surface of any light fixture or by a ground current rising above 5 milliamps; thus, any danger of shock is removed. The fountain's water is circulated by pumps, passing by gravity through a 24-inch cast-iron pipe to the lower fountains, before flowing to a concrete 30,000-gallon surge tank under the section of the terrace containing the bubbler fountains. Recirculating pumps ensure water conservation, and fresh water is added occasionally to replace any losses. Great text, excellent pics. Blogging at its best!